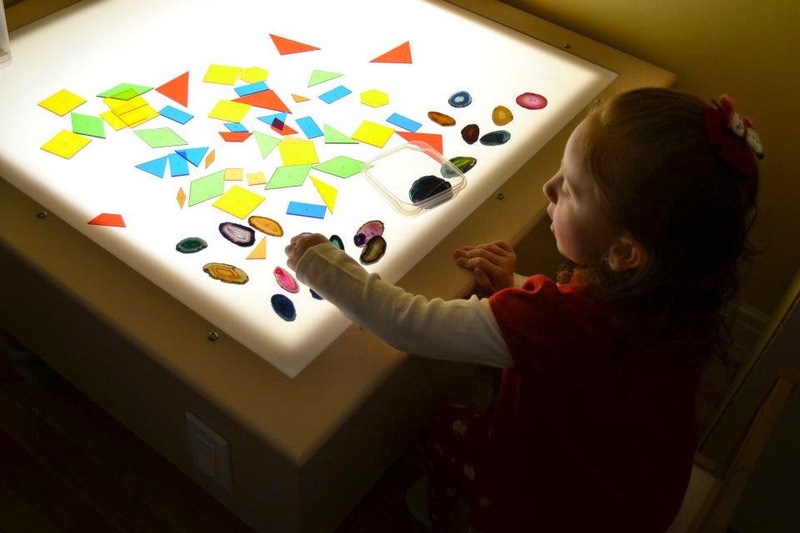 Making a light table or light box is not a bad thing, but there are some issues that could occur with making your own light box or light table. You could end up giving your child a gift that seems really cool at first, but ends up damaging their vision over time. Following a few guidelines will help tremendously. If you make or buy a light table or light box with harsh bright light showing through, poorly distributed light, visible light lines, not enough opaqueness, too much opaqueness, or one that has a completely transparent top, it could do damage over time. I have seen many pictures on blogs, facebook, and on pinterest of cheaply made light boxes made by parents with the very best intentions for their kids. The only problem is that in the long run they could pose a threat to the children's vision. If you see a tutorial online to make a cheap light box and the light box has a totally see through top, you do not want to make that light box. It is not a wise idea to have your child staring directly down into a light bulb, tap light, strip light, LED light, or set of Christmas lights for any period of time. You can remind yourself of this by simply staring at a light bulb for two minutes, how are you seeing now?? lots of spots eh?? The example pictures I have below are making me see spots! 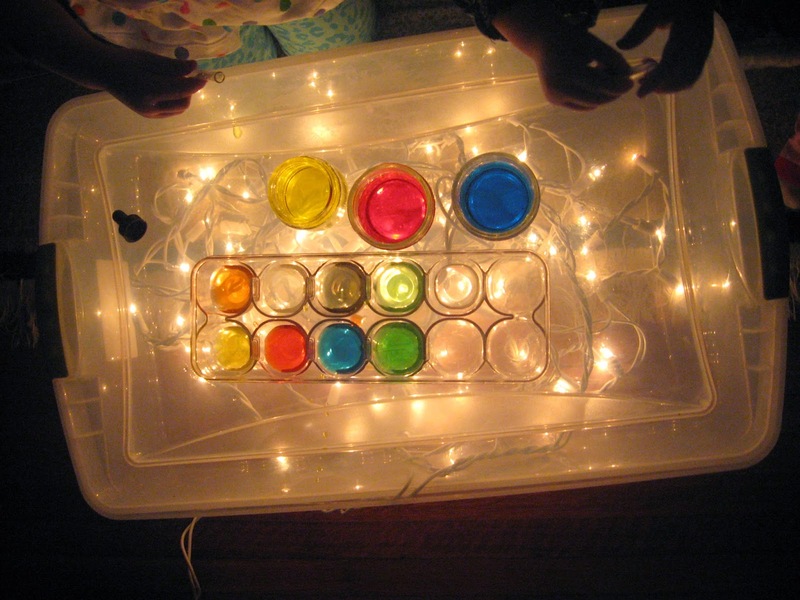 Most all incandescent or LED tap lights, and Christmas lights are generally a bad choice for a light source when you are making a light table or light box. Many of the smaller LED strip lights are also a bad choice. I have only found one brand of incandescent tap lights and LED strip lights that do not cause harsh lights, visible light source spots, or uneven distribution of light. You definitely don't want to use an LED tap light or strip light that makes a blue hue of circles through the top of your light box/table. You can see an example of a blue hue coming through the top of a light box here. A light table/box should NEVER have a completely transparent top! Do yourself and your kids a favor, no see-through top home made light boxes!! Please also consider that a light box or light table should not have visible lines or circles from the light or lights that are inside the box or table. 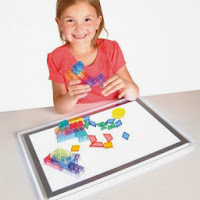 A light box or light table should not be so dimly lit or overly opaque that you have to adjust the pictures you take of your children playing with the light box to make the light look brighter before posting it to your instagram, blog, facebook, or other places that you post your photos online. Lastly, you don't want a light box that provides a really harsh bright light. It makes for very unappealing light box playtime. 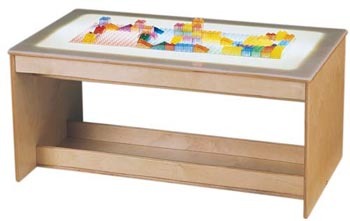 An example of this would be an artists light table for sketching and drawing. I thought I was a real wise gal and thought I was saving money by buying an artists light box. First off, the light was way too harsh. It seemed like it was NOT meant for direct light use. It is meant to have sketch paper placed on it so that you can see what you are drawing or tracing. Obviously this makes it a bad choice for a light box. I had to put contact paper over it to dull the light a bit. 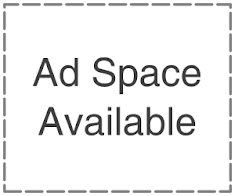 However, white was too opaque and would not work at all. Only the transparent contact paper would work and honestly it did not work too well. 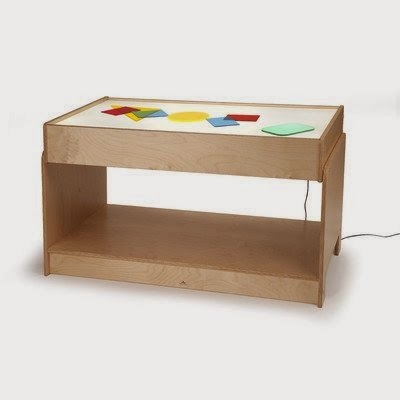 So we had to also put a clear sterlite box on top of the light table and put whatever we were playing with inside of it. An X-Ray box is slightly worse because of how harsh the light is. They are meant to make X-Rays visible to a Doctor or Surgeon, the light is very bright. Much too bright for a light box. Harsh, intensely bright light is not what a light table or light box should be. 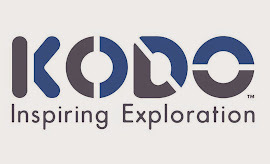 They are meant to open up a whole new light (no pun intended) to whatever you put on it for play, fun, and learning. They are not meant to cause headaches or vision problems after an hour or over a period of time with many uses. I finally gave up on our artists light box after a very short period of time, and ended up buying the ultra thin portable light panel by constructive playthings. These are examples of a poorly made light box or light table. The reason they are poorly made is because the tops are either completely transparent (see-through), or they have poorly distributed light. 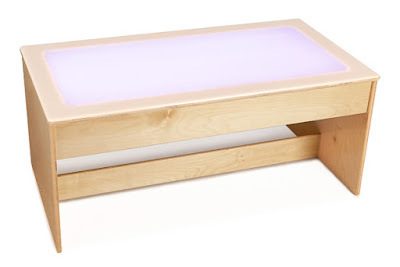 All of these DIY light boxes/tables will cause anyone to see spots and possibly harm their vision over time. I mean no true insult to the bloggers who made these light boxes/tables. I am sure they all had the absolute best intentions. 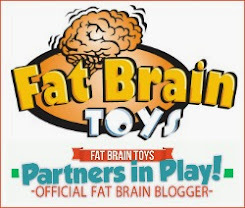 My comments may be harsh, but this does not mean I don;t think these bloggers have other quality content on their blogs. I get the desire to quickly get a light table or light box for your child, but sometimes it's better to wait a little longer. to get one if you can not drop the cash on making or buying a better quality light table or light box. This DIY light box from KIX cereal's website is completely transparent. This is a BIG no-no. you do not want a light box to look like this. This is not a light box, it is just simply a clear box with some lights tossed into it. Notice how they have to put the light table manipulative right over the tap lights? They could have used a glass frosting spray paint to make the top not be completely transparent. This is the same as staring down at a light bulb. 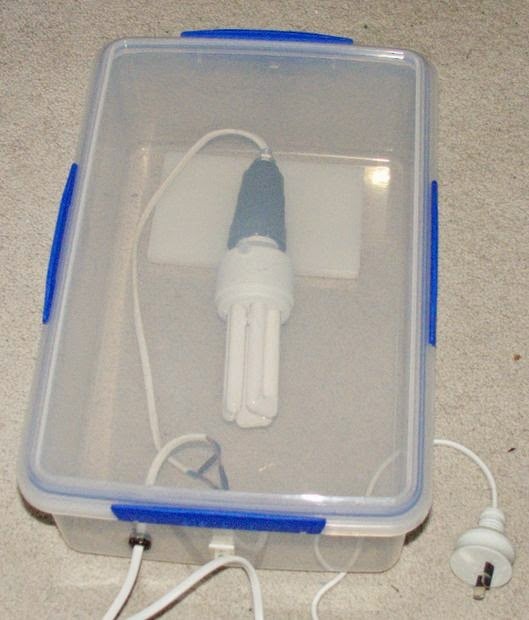 This DIY light box from instructabes has the same issue as the one above but it is one cluster of LED tube bulbs. This would be terrible on anyone's eyes as well. This DIY light box is a disaster. 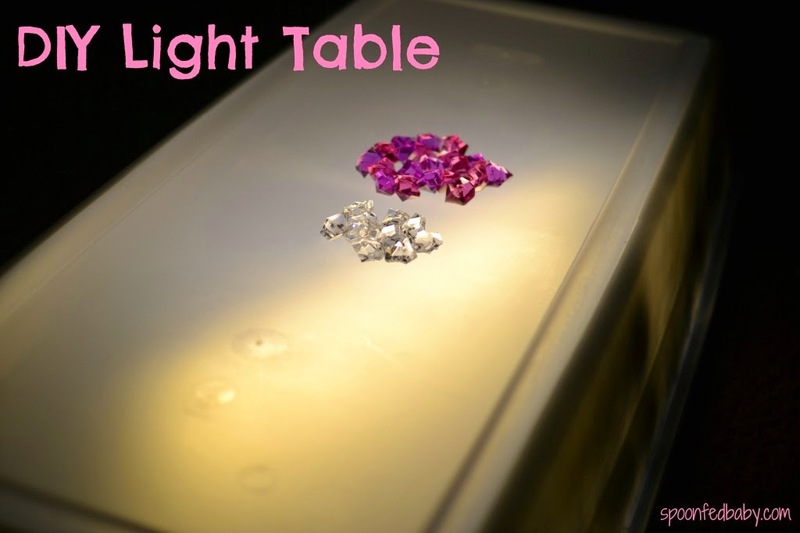 This DIY light table from Hobby Mommy Creations has the same issues as the two above except theirs is a rope light around the sides. The top is completely transparent. There is no distribution of light because the top is see-through. This is terrible on the eyes. 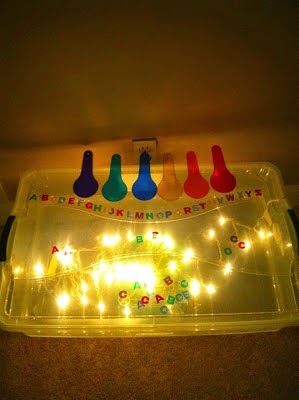 This DIY light box from Spoon Fed Baby looks to have one long light in it that only shows a terribly harsh yellow light one one side of the box. There is one good thing, at least the top is not transparent, the lighting choice is really bad though. 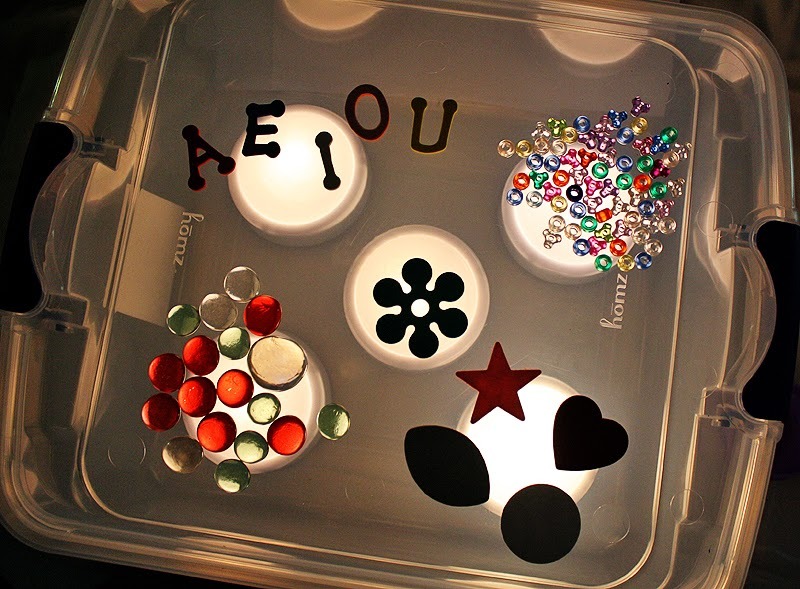 This DIY light box from Play at Home Mom's "AB" is a bit embarrassing to be coming from the PAHM website. 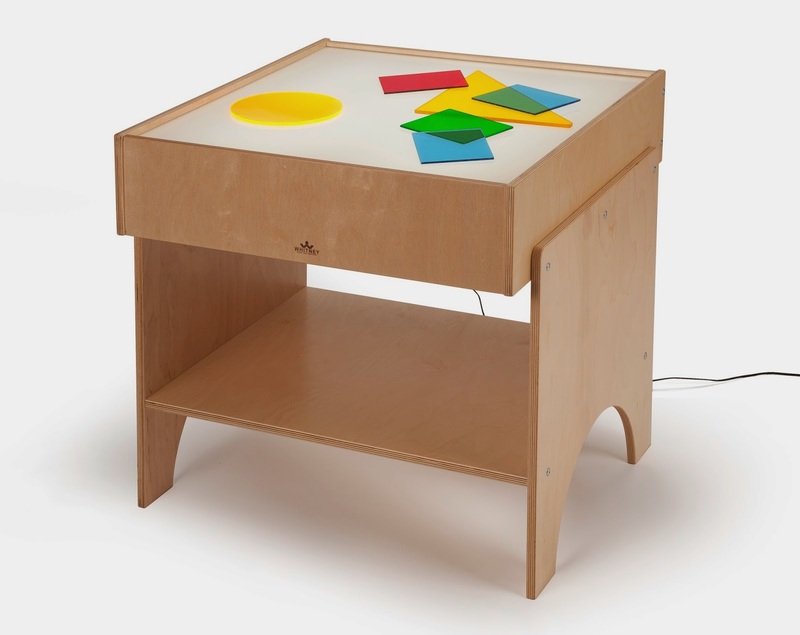 RL and AK have great light table choices, but this one by AB is a not good. Seriously, don't use a clear box and throw some Christmas lights into it...again this is not a light box. It is a box with some lights haphazardly tossed into it. This DIY light table from Chubbs n Hoover is another example of poorly distributed light and the top is too see-through. This light table needs some work, but has a lot of potential. This DIY light box from Pumpkins and Me is another PAHM AB nightmare clear box with Christmas lights haphazardly tossed into it. 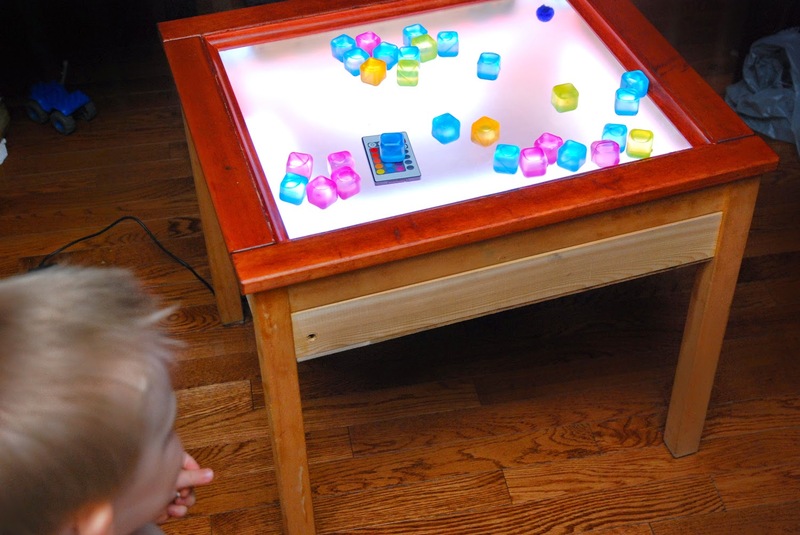 DIY light table by Play at Home Mom's "RL"
Here are the best commercially made light tables out there right now, outside of getting a commercial school grade light table. They are beautiful but quite large and very pricey. 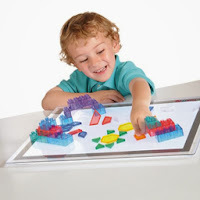 If you are looking for an excellent starter light play source, the Constructive Playthings light panel is a great option. The light panel has even light distribution and is well constructed. I highly recommend this light panel. You can not go wrong with it. Plus, if you decide to upgrade to something larger later, it can be used as an extra. That comes into handy all the time for us! 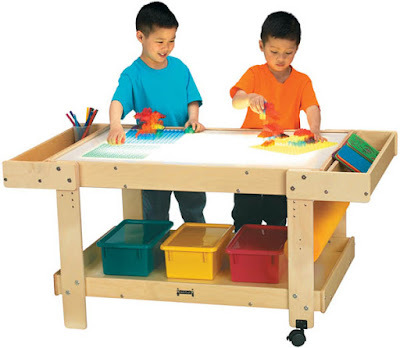 If you are looking for something a bit larger, the best choice is a Whitney Brothers or Jonti Craft light table. They are gorgeous! The light is evenly distributed and the table is very well made. All Whitney Brothers and Jonti Craft light tables are green guard certified too. The price is bit higher than a light panel, but well worth the money. 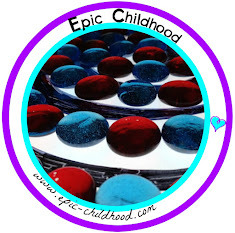 Follow Kristen (Epic Childhood)'s board Light Table Play 101 on Pinterest. 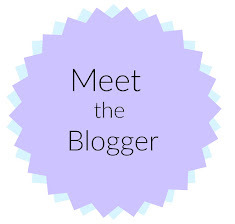 Hi.. it's nice to find your page. 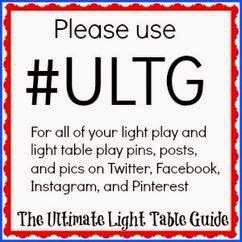 I'm interested in ultg and want to have diy light table, but also concern about the effect to my son's eyes. I wonder is it possible to contact you via whatsapp or line to consult about this? Really appreciate your kind help. Thank you.